"This is not a disease only of modern circumstance but a basic feature of human aging in all populations," said Caleb Finch, USC University Professor, ARCO/ Kieschnick Professor of Gerontology at the USC Davis School of Gerontology, and a senior author of the study. "Turns out even a Bronze Age guy from 5,000 years ago had calcified, carotid arteries," Finch said, referring to Otzi the Iceman, a natural mummy who lived around 3200 BCE and was discovered frozen in a glacier in the Italian Alps in 1991. With Gregory Thomas of Long Beach Memorial, Finch was part of a team that previously showed Egyptian mummies had calcified patches on their arteries indicative of advanced atherosclerosis (from the Greek arthero, meaning "gruel" and scler, meaning "hard"). "Our research shows that we are all at risk for atherosclerosis, the disease that causes heart attacks and strokes – all races, diets and lifestyles," said Thomas, medical director of the MemorialCare Heart & Vascular Institute, Long Beach Memorial. "Because of this we all need to be cautious of our diet, weight and exercise to minimize its impact. The data gathered about individuals from the pre-historic cultures of ancient Peru and the Native Americans living along the Colorado River and the Unangan of the Aleutian Islands is forcing us to think outside the box and look for other factors that may cause heart disease." 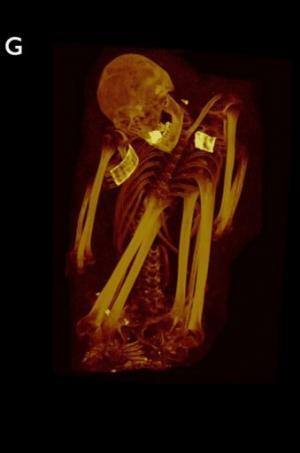 Image provided by the Lancet press office on March 8, 2013 shows a CT with 3D volume rendering of Hatiay, a mummified male Egyptian scribe aged 40-50 years, who lived during the New Kingdom (1570–1293 BCE) and was found near modern day Luxor. Scans of mummies from as long ago as 2,000 BC have revealed that ancient people also had clogged arteries, a study said Monday. 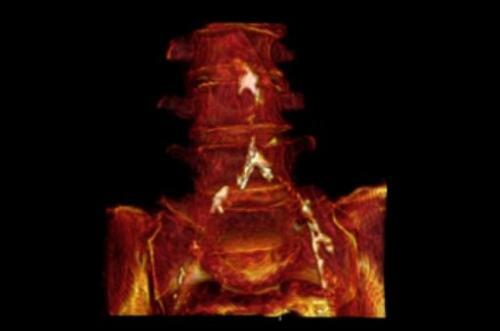 Image provided by the Lancet press office on March 8, 2013 shows a CT with 3D volume rendering of the aortic and iliac calcification in a mummified woman aged 45-50, of an unknown era in ancient Egypt, who was found in the Fayoum Oasis. A study of 137 mummies from four geographic regions has revealed that atherosclerosis may have been more common among ancient people than previously thought. 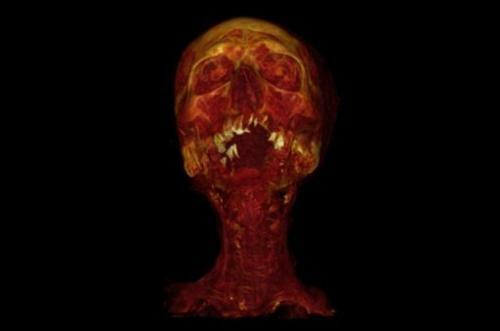 Image provided by the Lancet press office on March 8, 2013 shows a 3D MIP of a mummified woman from ancient Peru, aged 41-44, of the Early intermediate to Middle Horizon (200–900 CE), that was excavated from Huallamarca, Peru. A study released Monday has revealed that ancient people also had clogged arteries.